I love children's fiction. Reading it with my children, or reading it alone. We were halfway through our second lap of the Famous Five series when we took a detour through the Deep South with Tom Sawyer and found a new literary hero. We followed him up with Huckleberry Finn but the going got a bit heavy for my six-year-old and he jumped off the raft to build his own instead. 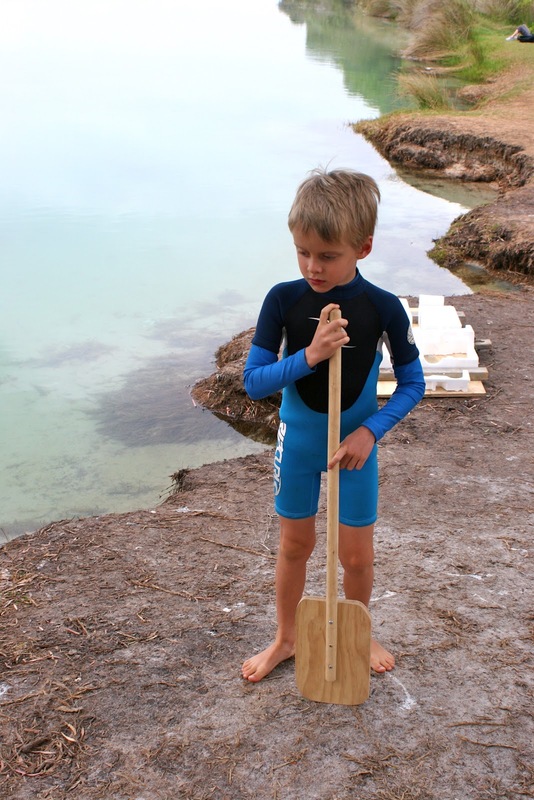 Using the left-over pieces of ply-board from our hen house roof and some timber off-cuts they found lying around the yard, father and son managed to use every power tool in the shed to cut, plane, drill and assemble their very own raft and paddle. 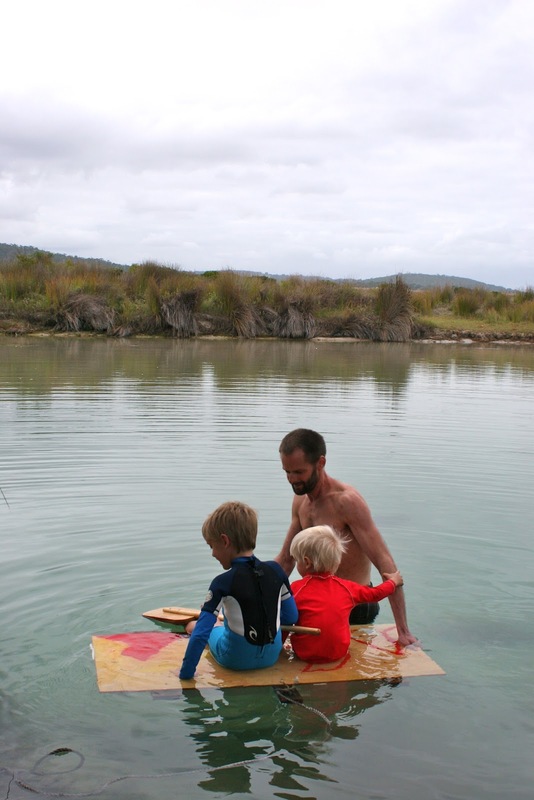 A test float in the inlet found it was somewhat lacking in buoyancy, so Lewis stuck polystyrene packaging over the bottom of the raft and painted flames over the top using his watercolours. We took it down to the channel on the weekend for its official launch. While the inlet's passage to the sea is open for a few months each summer the water runs clear and blue through the channel under the peppermint trees. Children swing from ropes looped around the trees' weathered old limbs into the deeper water near the crumbling banks, and toddlers splash around their parents' legs in the shallows. On Sunday the sky turned steely grey. The relentless summer winds had filled the sandbar's narrow mouth with pure white sand and stilled the waters' flow. So we had the channel to ourselves and Lewis could imagine himself alone on the wide open waters of the Mississippi. I finished the book alone last night and lay it aside for a few years along with the tales of piracy and adventure which have proved a little overwhelming for my boy's imagination. They are classics of boyhood which I never chanced to read as a girl. Robinson Crusoe and Treasure Island - tales of shipwreck and discovery. I am looking forward to revisiting them when he is ready. But I would say Huckleberry Finn still captured his heart, even if Tom Sawyer remains his hero. Thank you Kim (and thank you lovely Rachel). Lewis is a lovely name, I do think!